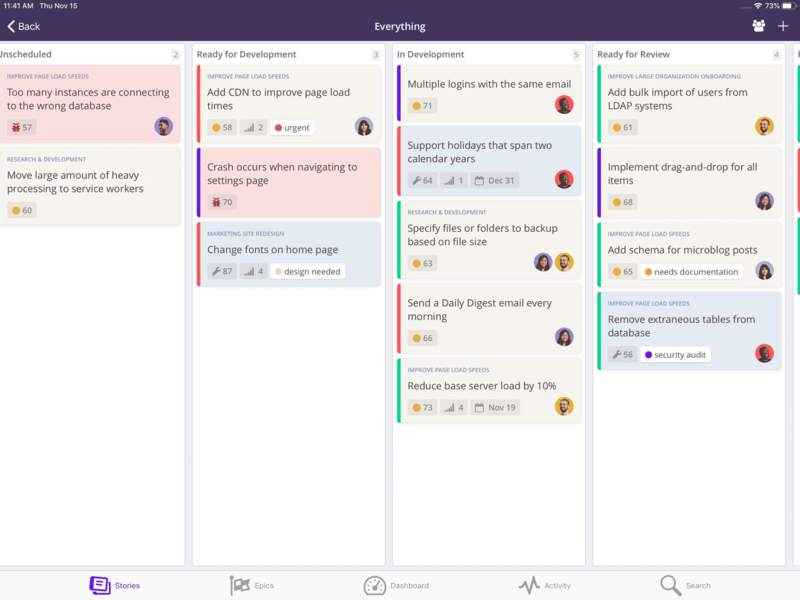 We review Clubhouse, an online project management software for software teams and engineers. Frank is a senior editor and productivity enthusiast. Loves hunting and reviewing new tools. When he's not writing he's normally cooking, gardening or reading. 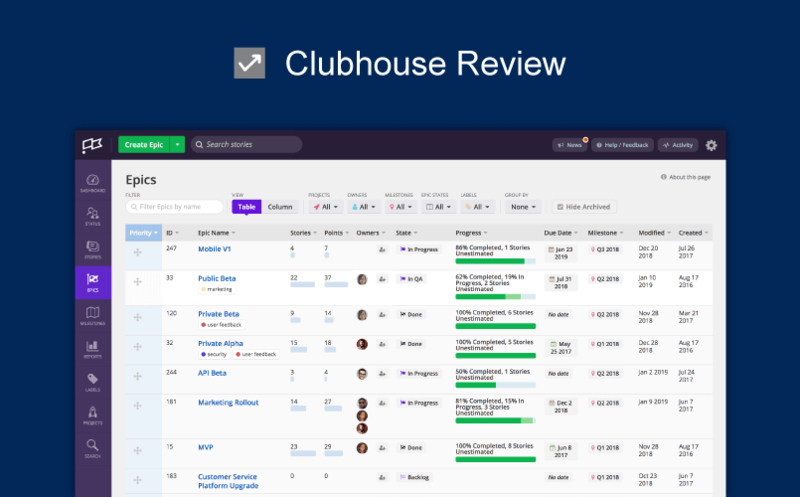 Today we are going to review Clubhouse, a project management software for software and dev teams. I heard about Clubhouse earlier in February when they reached out to us via Twitter. It seemed like a great tool, and I decided to check it out. Going through their website, I found out that Clubhouse had a lot to offer for Agile software development teams. So, it was only right that we did a Clubhouse review. “I had worked with every tool out there and complained about them for the past 20 years. It’s very hard with some of these tools to see things at a higher level, kind of pull back and see the big picture. One of the things we’ve really focused on is to make it easy for management, for other parts of the company to — all the way up to the C level — to see what’s going on, what the priorities are, rather than just hundreds of tickets cascading down. It’s designed to scale as a company grows. 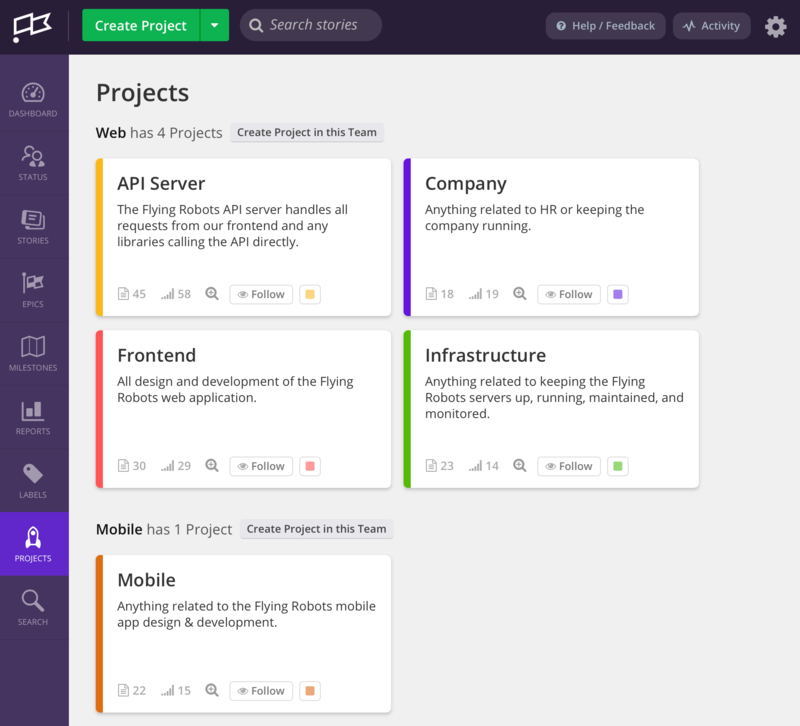 Unlike more generic project-management tools like Asana or Trello, it’s hyper-focused on engineering and product teams. We’ve also really focused on bringing in other teams around the company. When your engineering team is deploying faster and product is working faster, you don’t want things to be held up by a marketing release or things like that. Signing up on Clubhouse is a breeze as it should be. The on-boarding was quick, hassle-free and intuitive. Being a software critic, I do look into granular details that influence user behavior and I must admit, Clubhouse passed with flying colors. Once you’re inside the web application you’re greeted with a slick guided tour. More than the design I enjoyed how the focus was on the core building blocks and methodology on which Clubhouse operates instead of the traditional navigational app tour itself. I was so intrigued by the overall design thinking behind Clubhouse that I thought why not hear about it straight from the horse’s mouth. Here’s what Team Clubhouse had to say about the their design philosophy. Clubhouse was designed to be approachable to everyone in a software team, regardless of how technically-minded they are. Clubhouse was designed to be self-explanatory, self-discoverable, and light on configuration, because the more time you spend reading documentation or trying to configure your tool, the less time you’re able to spend on actual work. After having used Clubhouse, I have to say it does good justice to the product’s vision. The navigation is easy and various options and call-to-actions are well laid out. Call it a personal preference but I do enjoy applications that use the real-estate well and I had a feeling that create new ‘project’, ‘story’ and ‘epic’ popups could be a touch bigger to give users more breathing space to play with. In a nutshell, Clubhouse is cleverly designed with easy navigation, contains flexible usability options and well equipped to get the job done. 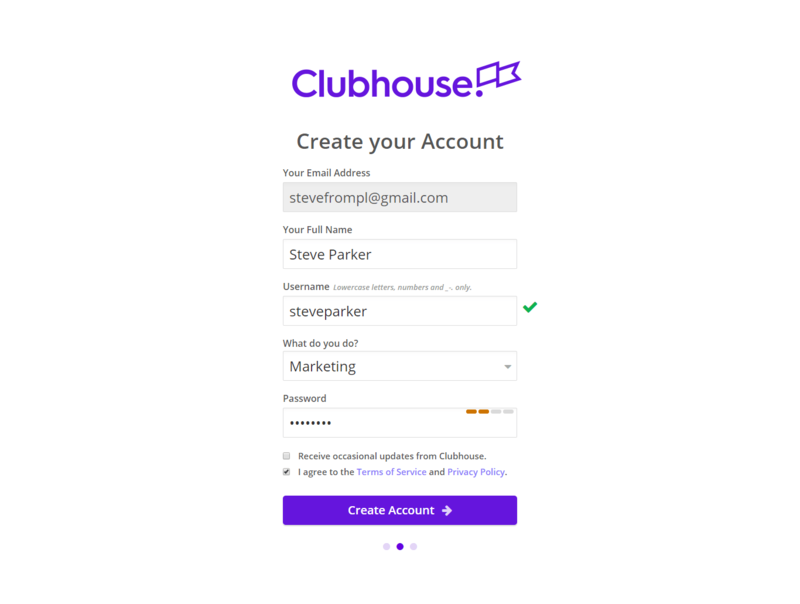 When it comes to features and functionality of the platform, Clubhouse does not disappoint one bit. It has various native integrations available, REST API support, detailed structure and workflow settings, customizable templates, reporting, Milestones, Epics, Stories and more. Let’s dive into Clubhouse and see what it has to offer for software and development teams one by one. Upon signing up, you are sent an email containing a verification link. Click on it and you are redirected to the onboarding process. This is a 3-step onboarding process asking you to set your organization information, your name and information and send out invitations to your organization members. You are at the Stories board. On the left is the main navigation panel. We will dive into each of these in a bit. Settings – all your workspace and team settings. We’ll talk more about settings in a bit. The dashboard is your home page in Clubhouse. It gives you a quick summary of what you are working on, what needs to be done and what is still unfinished. The dashboard also keeps track of all new activity that has happened while you were away as well as direct mentions addressing you in task comments. 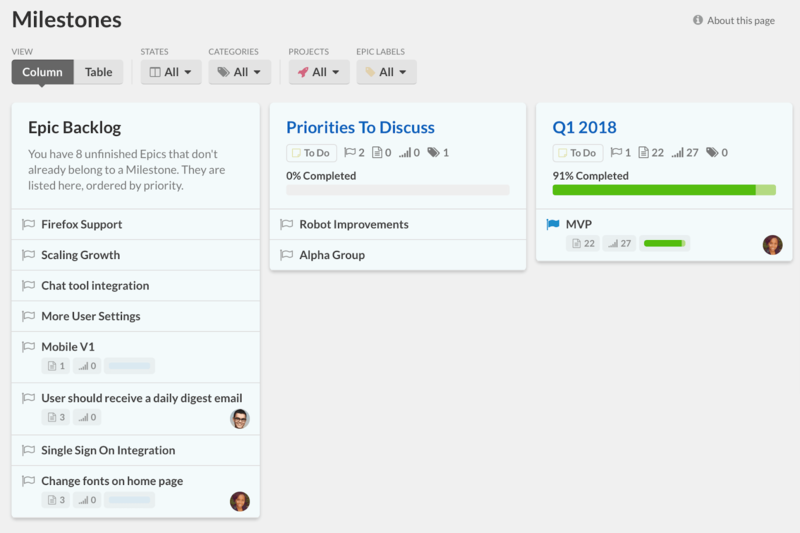 The Status board outlines all the Stories that are assigned to your team members. It gives you a quick summary of displays all Unstarted, Started, and Recently Done (completed within the last business day) Stories by owner. This is useful to keep track of what initiatives each team member is presently working on, has recently completed and what they are going to work on next. There are two views on the Status board – Stories, useful for smaller teams and a Compact view for larger teams. Next up – Projects. These are the initiatives your team is working on. 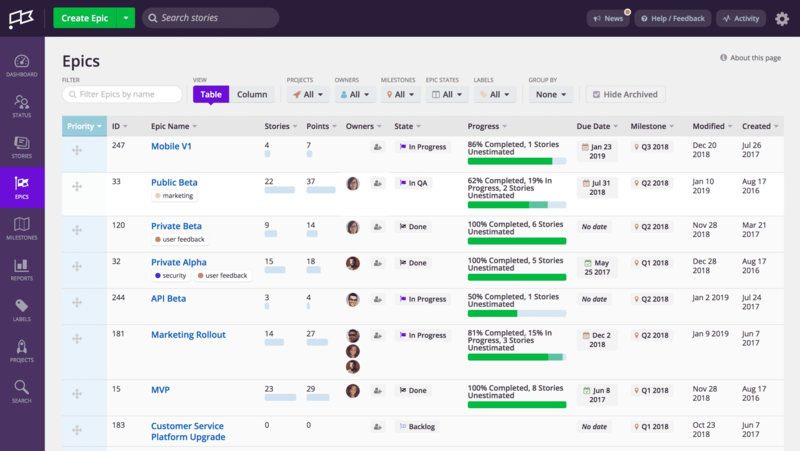 One good thing about Clubhouse is that it provides you a healthy segregation of your tasks via Milestones, Epics and Stories, so projects can have a well-defined hierarchy under them. This is especially useful for large-scale enterprise projects where various software teams are cross-collaborating to get things done. The Projects board provides an overview of all your Projects, the total number of Stories in them, and the number of points they represent. Clubhouse also offers estimation points as a feature. Click on a project tile and it will lead you to the individual project page, aimed to provide a more detailed overview of the project. Details include a table of all the project’s Stories as well as a breakdown of Story types, information on recent updates, and Project-specific reporting. 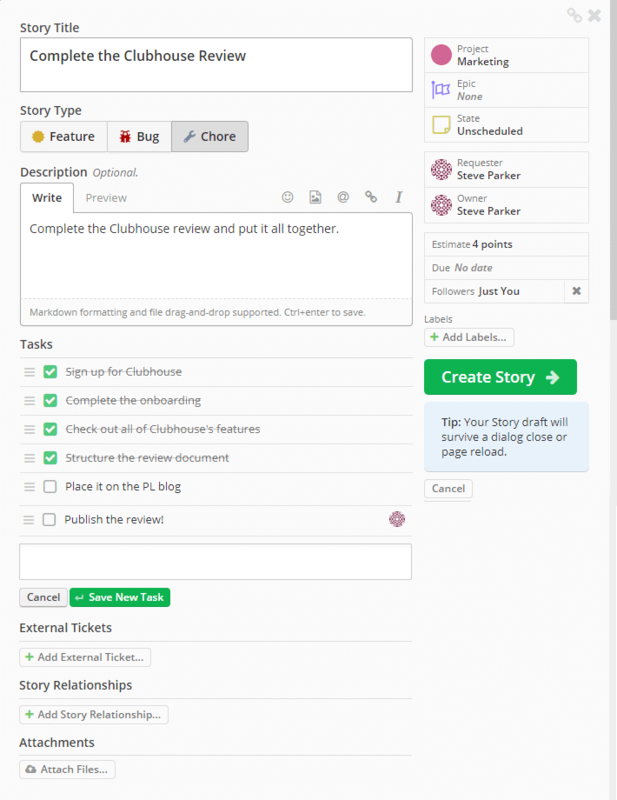 Once you have your projects set up, you can now set up Stories, the standard unit of work in Clubhouse. Stories are a collection of different tasks that you need to perform. Your Stories board is where you will spend most of your time if you are a Clubhouse user. Individual tasks in Clubhouse are more like checklist items that you check off the list as you complete them. Although I did not find advanced task settings, such as Start and End time, and repeat tasks, Stories have a lot of settings and options that you can leverage. Another useful feature in Clubhouse is the Story Staleness feature. You define the number of days after which a Story will go Stale if there has been no activity. With so many items in Clubhouse, inactive Stories could have been difficult to monitor. Therefore, Stale Stories make it easier for project managers to take necessary action in a timely manner. Once you have a bunch of projects and a bunch of Stories inside them, it might often be the case that you need to group a few Stories from different projects together. Epics in Clubhouse make that happen. They usually come in handy when two different project teams are to work together. Without Epics, keeping track of cross-project collaboration would have been a challenge. To create a collection of Epics, you can create Milestones in Clubhouse. There are two primary views to organize your Milestones: Table view and the Column view. On the Milestones board, you get a zoomed-out picture of all your Milestones. These Milestones can then be filtered by States, Categories, Projects, and Epic Labels. Another big plus of managing your projects with Clubhouse it that there are a lot of integrations available. Clubhouse integrates with Zapier, which makes 400+ integrations possible. On top of this, Clubhouse has native integrations for over 15 other apps, including Google Drive, BitBucket, Dropbox, GitLab and Zendesk. That’s useful when you have a bunch of apps you’d like to see work together in harmony. To top it all off, Clubhouse also offers REST API support. Generate a token access your data inside Clubhouse using REST APIs. Create your own integrations as you see fit. This is specially useful for software development project teams who like to use a host of specialized tools and integrations at work. Also, you can choose to enable/disable certain integrations for your organization on Clubhouse and manage your team’s access to app integrations with just a click. A great added functionality. For reporting with Milestones, Clubhouse offers two kind of reporting charts – the Burndown chart and the Velocity Bar chart. The Velocity Bar Chart is visualizes progress of Stories or Story Points completed across several iterations. 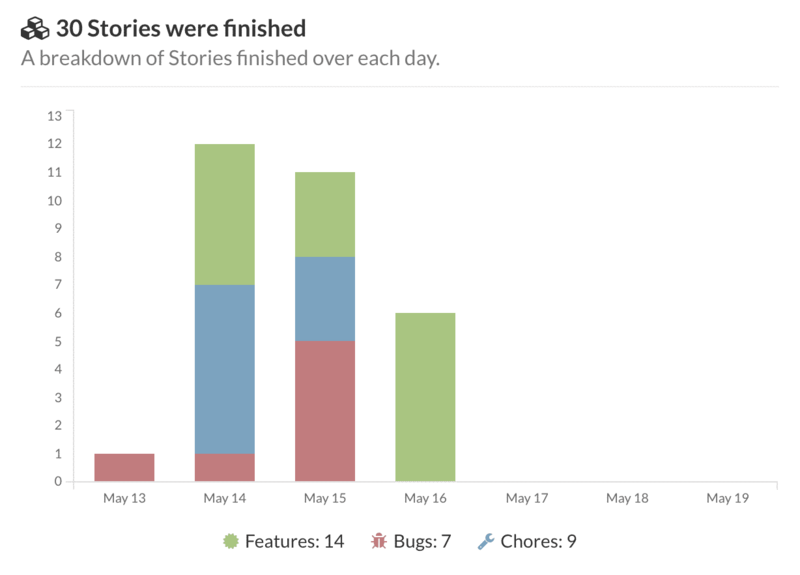 The Milestone Burndown Chart tracks the remaining Stories across all Epics that are part of any given Milestone. For project reporting, The Reports page helps you visualize activity across Stories, Epics, Milestones, and Projects. Reports can be viewed either within your current iteration or a custom timeframe. One drawback of having your team on Clubhouse is that an Android app is missing from the picture. While Clubhouse does offer an iOS app, it does not provide support for Android users so you will have to access the web app if you’d like to stay in the loop on the go. To improve ease of use, Clubhouse has also introduced keyboard shortcuts in the app. These are quick timesavers that simplify your process of managing tasks, teams and projects in Clubhouse. To get help/support and share feedback, Clubhouse offers one-click ticket submission using the app. Simmply click on Help/Feedback and fill in your details on the support form. Someone from the Clubhouse team will get back to you. Live chat support is not available. You cannot dial in a phone number to reach Clubhouse support either. If you run into any problems with Clubhouse, the support form will have to suffice for now. Clubhouse does not offer a free plan and only comes with paid and enterprise pricing. Small – $8.33/user/month when billed annually – for up to 10 team members. Standard – $8.50/user/month when billed annually – for 11+ team members. Enterprise – Request a quote – includes SAML/SSO, dedicated account manager and priority support. Clubhouse offers free/discounted options to qualified non-profit organizations. All data rendered on the site from APIs. This means that all permission controls are enforced at the API level, and changes to frontend code aren’t exposed. Use of best practices like HTML-escaping user-generated content and setting precise header requirements for things like cross-origin requests. All attachments that users add to Clubhouse stories are encrypted at REST and in transit. All infrastructure that holds user-related data or may serve up user-related data sits within a secure private network. Strict rules are enforced around the principle of least privilege when determining where incoming connections are allowed from. Next up in this Clubhouse review – customer support. Clubhouse has a dedicated support portal for its customers to submit any tickets or queries which are responded to in a timely manner. Below are a few support options available. Webinars & Demonstrations: Clubhouse account managers and customer success team is available to help users get on-board and guide them through the application via online demonstrations and webinars. Social Media Support: Clubhouse entertains social media support on Twitter and Facebook along with help tutorials and products information is also available on their official blog. Clubhouse was a delight to use. It has a great set of features and the platform has really come far in such a short span of time when it comes to product maturity. Although there are a few features missing from Clubhouse, the host of integrations available are a great add-on. What do you think about Clubhouse? Will you use it to manage tasks and projects? Let me know in the comments below. You can also use ratings to impact the overall score. So, do leave us your ratings. What project management software would you like me to review next? Ping me at [email protected] with your ideas and suggestions.